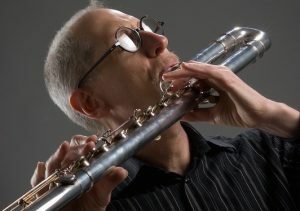 Flutist, guitarist, and composer, Carl Dimow, is an eclectic and creative musician whose performances range from classical music to jazz, klezmer to blues, and from original music for theater and film to traditional folk music. His performances have been hailed as “mesmerizing”, “brilliant”, and “sublime”. This quartet focuses on the jazz side of Carl’s musical expression, combined with some blues and funk, and exploring the beautiful possibilities of the flute and bass flute as lead instruments in jazz. David Newsam - guitar - David is an exceptional jazz guitarist who has taught at Berklee and UNH for decades. He's a creative, swinging player who comes out of the Wes Montgomery tradition. John Hunter - bass – A seasoned performer with a beautiful sound, John has worked with many icons of jazz including Dizzy Gillespie, Clark Terry, Slide Hampton and Sheila Jordan, to name just a few. Gary Gemmiti - percussion – Always in the groove and creative, Gary is one of just a handful of drummers in this area who are deeply rooted in the great jazz drumming tradition. ‘WORST DAY OF THE WEEK’ Comedy Night!